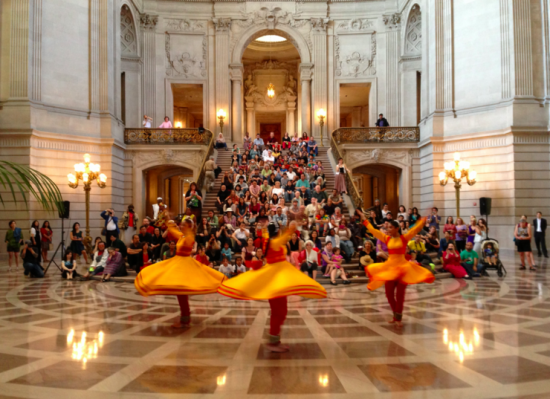 On Friday, April 11, the Rotunda Dance Series will present Tiruchitrambalam School of Dance performing three dances—ranging from solo to group work, and abstract to story-driven pieces in the classical Indian dance form, Bharatnatyam. The Tiruchitrambalam School of Dance strives to transcend the boundaries of tradition and widen the aesthetic appreciation of Bharatnatyam by journeying beyond regional barriers. It is located in East Bay and has been training students from 5 to 20 years old in the dance form Bharatnatyam for the past ten years. Tiruchitrambalam has liaised with leading community organizations like Kalalaya, Bharathi Tamil Sangam, Guru Shradha and Taringini, among others and produced large operatic dance ballets such as Silapathigaram, Sense Beyond, Triveni and Sivagamiyin Sabadam. Several students have graduated from Tiruchitrambalam and continue to teach and pursue careers in dance. The Artistic Director of Tiruchitrambalam, Deepa Mahadevan, is an avid performer and teacher, and is currently pursuing her PhD with the University of California, Davis, in the Performance Studies Graduate Group.